Consider this your unequivocal inner battle cry for the year ahead. 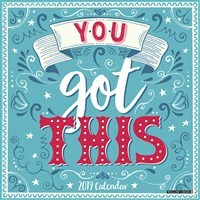 You Got This combines confidence and encouragement in beautifully illustrated typography to make sure each monthly message is recieved loud and clear. This large format wall calendar features grids with ample room for jotting notes and begins with six bonus months of Jtuly through December of 2018. Also included are moon phases (CST), along with U.S. and international holidays.